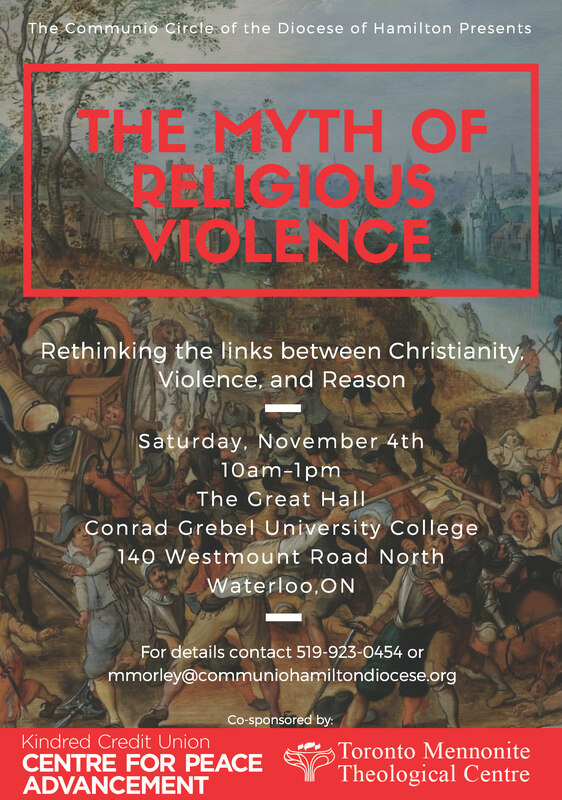 “The Myth of Religious Violence: Rethinking the Links between Christianity, Violence and Religion” is a study day that will give participants an opportunity to engage with the work of William T. Cavanaugh. The myth of religious violence is the pervasive secularist idea that there is something called “religion,” endemic to all human cultures and eras, that has a tendency to promote violence because it is essentially prone to absolutism, divisiveness, and irrationality. On this view, “religion” must therefore be separated from “secular” phenomena like politics for the sake of peace. Cavanaugh’s book (The Myth of Religious Violence) argues that this myth is a piece of Western folklore that underwrites Western violence. After considering the main argument of his work on the myth of religious violence, we will consider just war and pacifist responses. Participants are encouraged to read two essays by Cavanaugh: “A Fire Strong Enough to Consume the House” and the “Wars of Religion and the Rise of the State and Religious Violence as Modern Myth” to prepare for the day. Dr. Kyle Gingerich Hiebert is the Director of the Toronto Mennonite Theological Centre. Kyle holds a PhD in theology from the University of Manchester, and degrees from the University of Nottingham, the University of Toronto, and Canadian Mennonite Bible College. He is the author of God After Christendom (with Brian Haymes) and of the recently released The Architectonics of Hope: Violence, Apocalyptic, and the Transformation of Political Theology. Max Kennel is a PhD student at McMaster University, working on religion and violence. He is also a Grebel M.T.S. alumnus and sits on the Board of Governors of Conrad Grebel University College. Charles Fernandes is a Deacon of the Catholic Diocese of Hamilton, serving at St. John the Evangelist Parish, Dundalk in Grey County. Charles is one of the founding members of the Communio Circle of the Diocese of Hamilton, and holds an M.A. in Religion and Culture from Wilfrid Laurier University, and a B. Math. from the University of Waterloo.